“WHITE TAIL” is an original oil painting by Billy R. Harper resident of the Yellowhammer State, Alabama. Billy is a paraplegic from a spinal injury in 1985. Billy is a self-taught artist and began by drawing animals in 1987. 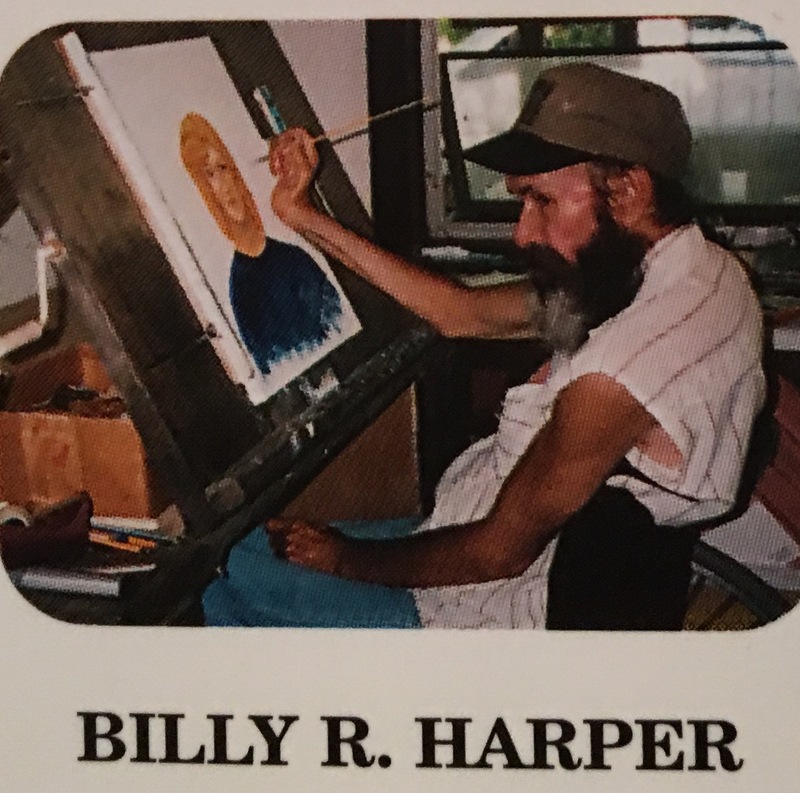 Billy mostly paints angels today as he feels these paintings of angels will bring peace to this earth. This greeting card was reproduced by Billy R. Harper for THASC Sales Co. of Margate, Florida. THASC has employed a unique group of handicapped artists who create art to help rehabilitate themselves. They gain self-respect and pride through their work. I remember waking up last summer to notice that there was a large white-tail deer (doe) lying under one of my evergreen trees in the back yard. At first I didn’t notice her baby fawn who soon after came bouncing out from under the tree. I immediately became fascinated with its white tail. Now that we see them more and more in gardens and on lawns, they are found also everywhere else like forests, fields, streams and meadows. They generally keep to forests in winter. Adult white tails have reddish-brown coats with a white belly and tail in summer and in winter they fade to a grayish-brown color. Male deer, called bucks, have large antlers in summer and fall. They mark their territory by rubbing their antlers on trees. The antlers have sharp points which fall off in winter after the breeding season. These antlers are perfectly seen in Billy R. Harpers painting “WHITE TAIL”. Billy’s painting captures the quintessential male buck, which can be up to four feet tall and weigh up to 300 pounds. Female deer are called does and may give birth to up to 3 fawns, or baby deer, at a time in May or June after a pregnancy of 7 months. The number depends on how old they are and how much they eat. After a year of staying with their mother, she sends them away before reproducing again. 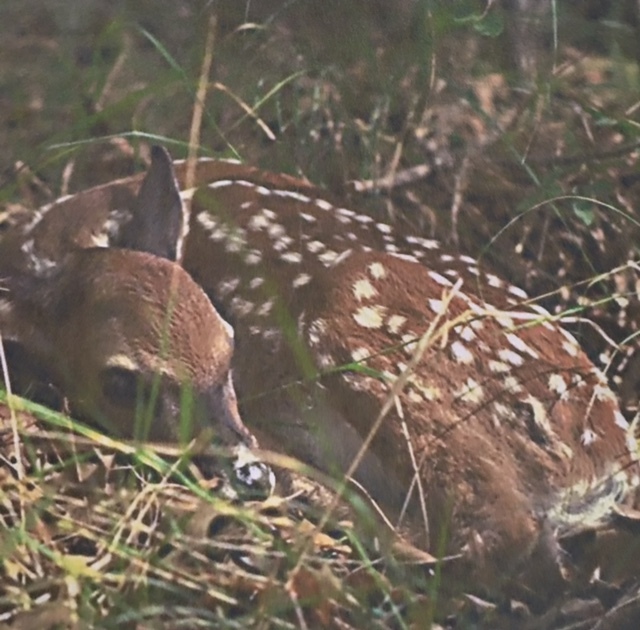 A doe hides her fawns in the brush while she feeds. Her fawns have many white spots on their coat, which help them blend in with the forest. If the mother doe is alarmed, her white tail automatically is raised while she runs so her young can follow her. 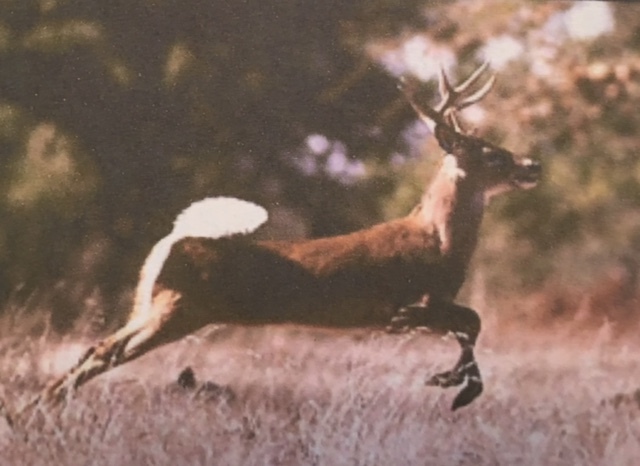 White tails can run very fast (up to 30 miles per hour). They can leap up to 10 feet high and 30 feet long in a single leap. 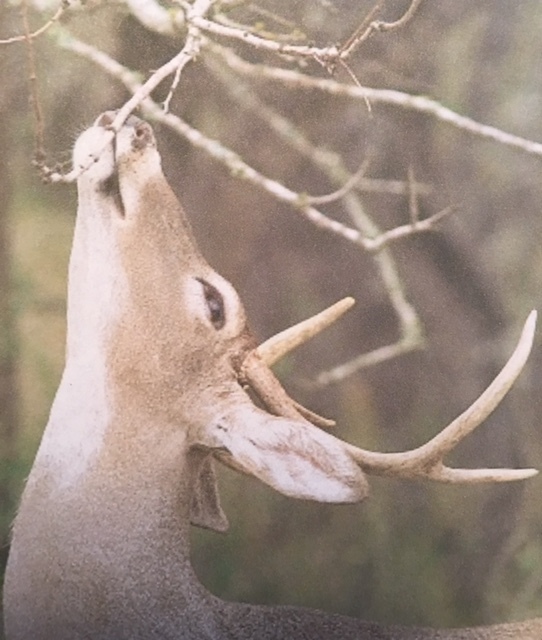 White tails eat mostly plant foods in summer, but can digest various foods like acorns, fruits, and nuts in fall and twigs in winter. For those of you like me, who find deer in your backyard, BEWARE! 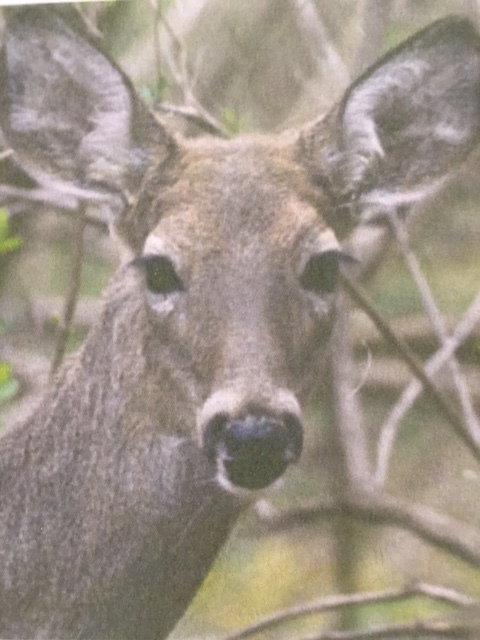 Deer eat a lot of garden plants, vegetables and small trees from your yard! It is noteworthy to mention, however, that white-tailed deer are primarily nocturnal. They have few predators, and are mostly killed by hunters or cars. 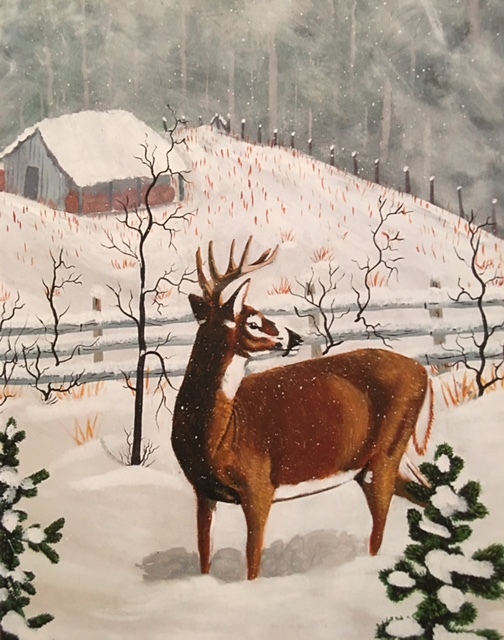 Billy R. Harper’s depiction of an alert white tailed deer in his painting reminds us that when you startle this deer, all you see is a flash of white vanishing into the woods. See you on Thursday: almost time for Hallowe’en! Hey Maria, I wake up almost daily to see a deer or 2 or 3 in my backyard and sometimes in the late afternoon. They’re majestic animals but too fond of my apples, pears and figs so I love them and hate them! This spring, a doe and her 3 young visited almost weekly and still do. Those little ones have grown and still can out run my bulldogs flashing their tails as they bound back into the woods. It was such a treat to see the deer in your back yard last January. I couldn’t believe how brave they were just strolling through you neighborhood, babies and all. The painting is simply beautiful . I love deer, great painting. There’s something so peaceful about watching deer. I haven’t seen a lot of wild ones recently though. Humans are definitely their number one predator. We only hunt them to control population numbers. Sadly, overpopulation is based solely on when they become a ‘nuisance’ to people. They do eagerly destroy gardens though and only very high fences can keep them out. They are quite agile when it comes to jumping.